Hereditary sensory and autonomic neuropathy type V is characterized by lack of pain perception, mentally sound and partial anhydrosis, but with preservation of all other sensory modalities, including normal touch perception, proprioception, itch, warm and cold temperature discrimination and vibration (OMIM 608654). , It is caused by a mutation in the neurotrophic tyrosine kinase receptor, type 1 (NTRK1) gene located on chromosome 1 (1q21-q22), coding for nerve growth factor beta (NGFB) gene. , The loss of pain sensation interferes with body protective mechanism, sleep, mobility, nutrition, thoughts, sexual activity, emotional well-being, creativity, and self-actualization. Self-mutilation is an almost invariable feature of this disorder, most often involving the teeth, lips, tongue, ears, eyes, nose, and fingers. Bone fractures are also asymptomatic and affected individuals are not aware of these fractures until a limp develops. This is an extremely dangerous disorder, but people can live a fairly normal life, provided, they constantly monitor for their cuts, bruises, self-mutilations and other possible unfelt injuries. This clinical report outlines a classical case of rare HSAN type V from central India highlighting the management of self-mutation to teeth and tongue. The report will also assist the oral health care providers in diagnosing the disorder and timely referral of such patients to the appropriate health care professionals . An 18-month-old girl, born to a healthy nonconsanguineous couple, was brought to our department for the management of self-mutilated biting of the tongue. She had normal milestones since birth. At the age of 7 months, her parents first notice that she did not respond to painful stimuli like injection of vaccines or any other accidental trauma. She had a history of heat intolerance, reduced sweating and fewer tears while crying. She had no history of recurrent fever, poor vision, seizure, skin rash, and bleeding manifestation. Parents gave history of biting of the tongue (since the eruption of teeth), grinding of teeth and repeated attempts to remove the teeth with fingers. Her taste sensation was normal. Pregnancy and birth were uneventful. There was no family history of neurologic or metabolic disorders, and no other member of their family was diagnosed with HSAN. On general examination, no signs of pallor, cyanosis, and icterus were observed. Hematological and biochemical investigations including serum uric acid levels were normal. Intraoral examination revealed self-mutilated features such as bitten tongue (resection of anterior one third of the tongue), ulceration on the ventral surface of tongue and auto-extraction of primary mandibular right and left central and lateral incisors and left canine. Primary maxillary right and left canines were un-erupted [Figure 1] and [Figure 2]. Cutaneous examination did not reveal generalized xerosis over ankles and dorsa of feet, thickening of palms, and fissuring of soles [Figure 3]. Sensory examination showed complete loss of pain and temperature sensations, but fine touch and vibration were preserved. Tendon reflexes and plantar responses were normal. Histological examination of the skin showed normal epidermal and dermal structures, including presence of normal sweat glands. Due to lack of availability of genetic tests, mutational study could not be done. Also, patient's parents were not ready for nerve biopsy because of invasiveness and nonfeasibility of the procedure. Based on the clinical findings, degree of both sensory and autonomic dysfunction, biochemical evaluations and skin histological features the probable diagnosis of HSAN type V was made. The parents were explained the importance of the remaining tongue and various treatment options. Patient parent did not agree for full mouth extraction of teeth because of the psychological and functional implications. Then, it was decided to give bite guard to prevent self-mutilated trauma to the tongue. 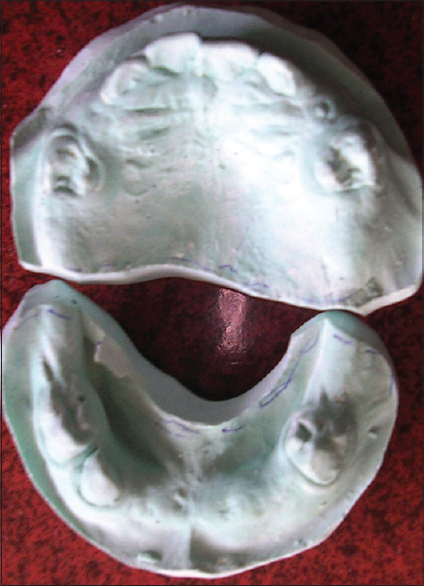 Maxillary and mandibular jaw impressions were recorded in alginate and casts were made in die stone. Bite guard was prepared from biocryl X sheet, (Grate Lakes Orthodontics, Tonawanda, NY, USA) using Ministar pressure forming machine (Grate Lakes Orthodontics, Tonawanda, NY, USA). Bite guard was modified in such a way that it covered the palatal surface [Figure 4]a and b. Patient's parents were advised to remove the bite guard at an interval of 2-3 h. Patient was recalled weekly. After 1 month, there was no fresh episode of tongue biting. As the patient was too small to understand the importance of tongue and teeth, the bite guard was continued, and the parents were advice to report at 3 months interval. The parents were also advice for the regular visit to their physician, so that cuts, bruises, self-mutilations, any insensitive internal problems and other possible injuries are not un-left unattended. During 8 months follow-up period, she had a history of trauma, which resulting in an avulsion of primary maxillary right central incisor and primary mandibular right canine. Primary maxillary right and left canines were erupted [Figure 5]a. After a follow-up of 9 months, bite guard was discontinued as it was loose, and there was no fresh episode of tongue biting. Twelve months follow-up showed complete healing of tongue and there was no episode of self-mutilated injury to oral structures [Figure 5]b. The patient is on regular follow-up at 3 monthly intervals. Comprehensive literature search has revealed limited reports on HSAN type V. Till date only one epidemiological survey has been conducted on HSAN types IV and V in Japan in which questionnaires reported from 105 institutes were evaluated. The survey estimated that the number of Japanese patients with HSAN types IV and V were 130-210 and 30-60 patients respectively. Similarly, in 2004, a Swedish family, suffering from pain insensitivity underwent identification of a mutation in the NGFB gene responsible for pain sensation. They found severe reduction of unmyelinated nerve fibers and a moderate loss of thin myelinated nerve fibers which confirmed the diagnosis of HSAN type V. In the present case report, genetic test and nerve biopsy was not possible; therefore, the diagnosis was made on the basis of classical clinical features: the degree of both sensory and autonomic dysfunction and biochemical evaluations. Thus, the oral health care provider should be aware of other investigations to differentiate these neuropathies. Typical oral manifestations in HSAN type V are ulcers on the ventral surface of the tongue due to repeated biting during infancy (resection of anterior portion of tongue), auto-extraction of the teeth and tearing wounds mostly on the lower lip. , Oral management of these patients should focus on preventing injury to the tongue, lips, teeth, and oral mucosa. Children will require grinding of the teeth or extraction of all teeth or bite guard to prevent self-mutilation injury to the tongue and lips. Bite guard is preferred over the other options because: it not only prevents trauma to the tongue, but also maintains jaw relation, alveolar height, esthetic, helps in speech and mastication. Majority of reports in the literature with this disorder have advocated bite guard, but none of them had actually given it to the patient. In the present case, we have given a modified form of the bite guard that is easy to insert and remove and prevents swallowing or choking into the pharynx. Extraction of all the teeth should be avoided because that will have a psychological impact on children and might contribute to hyperthermia. If extraction of all teeth is planned, it should be done under local anesthesia to prevent undue tactile discomfort postoperatively. , Some authors have described the difference in concentrations of inhaled anesthetics needed for orthopedic surgery and dental surgery. They speculated that these differences were caused by the nociceptive stimulus of each operation. , Preventive dental care such as pit and fissure sealants, oral prophylaxis and professional topical fluoride application must be done. Parents should be made aware about the consequences of the dental caries particularly in relation to absence of pain. Type V HASN is extremely dangerous and in most of the cases the patient does not live over the age of 25. But with the understanding of this disorder and with helping patient to achieve independent function with minimal physical limitations we can increase the life of these patients. Further prognosis will be based on increased understanding of specific gene actions that will lead to definitive therapies. Diagnosis and management of HSAN type V is a great challenge to the oral health care provider. A rare case of HSAN type V, showing the usual features of bitten tongue was managed by a modified bite guard. Although genetic disorders affecting the sensory and autonomic nervous systems are rare, their existence provides a means of furthering our knowledge regarding a very complex part of the nervous system. Axelrod FB, Gold-von Simson G. Hereditary sensory and autonomic neuropathies: Types II, III, and IV. Orphanet J Rare Dis 2007;2:39. Sasnur AH, Sasnur PA, Ghaus-Ul RS. Congenital insensitivity to pain and anhidrosis. Indian J Orthop 2011;45:269-71. Houlden H, King RH, Hashemi-Nejad A, Wood NW, Mathias CJ, Reilly M, et al. A novel TRK A (NTRK1) mutation associated with hereditary sensory and autonomic neuropathy type V. Ann Neurol 2001;49:521-5. Online Mendelian Inheritance in Man. An online catalog of human genes and genetic disorder. Available from: http://www.omim.org/119530 [Last accessed on 2014 Oct 12]. Carvalho OP, Thornton GK, Hertecant J, Houlden H, Nicholas AK, Cox JJ, et al. A novel NGF mutation clarifies the molecular mechanism and extends the phenotypic spectrum of the HSAN5 neuropathy. J Med Genet 2011;48:131-5. Einarsdottir E, Carlsson A, Minde J, Toolanen G, Svensson O, Solders G, et al. A mutation in the nerve growth factor beta gene (NGFB) causes loss of pain perception. Hum Mol Genet 2004;13:799-805. Narayanan V. Oral and maxillofacial manifestations of hereditary sensory neuropathy. Br J Oral Maxillofac Surg 1996;34:446-9. Jacob A, Sarada C, Thomas SV. Painless injuries in a child: Hereditary sensory and autonomic neuropathy. Ann Indian Acad Neurol 2006;9:39-41.
de Andrade DC, Baudic S, Attal N, Rodrigues CL, Caramelli P, Lino AM, et al. Beyond neuropathy in hereditary sensory and autonomic neuropathy type V: Cognitive evaluation. Eur J Neurol 2008;15:712-9. Prashanth GP, Kamate M. A case of hereditary sensory autonomic neuropathy type IV. Ann Indian Acad Neurol 2012;15:134-6. Haga N, Kubota M, Miwa Z. Epidemiology of hereditary sensory and autonomic neuropathy type IV and V in Japan. Am J Med Genet A 2013;161A: 871-4. Tomioka T, Awaya Y, Nihei K, Sekiyama H, Sawamura S, Hanaoka K. Anesthesia for patients with congenital insensitivity to pain and anhidrosis: A questionnaire study in Japan. Anesth Analg 2002;94:271-4. Okuda K, Arai T, Miwa T, Hiroki K. Anaesthetic management of children with congenital insensitivity to pain with anhidrosis. Paediatr Anaesth 2000;10:545-8. Mitaka C, Tsunoda Y, Hikawa Y, Sakahira K, Matsumoto I. Anesthetic management of congenital insensitivity to pain with anhydrosis. Anesthesiology 1985;63:328-9.